🎞️ How do barcodes work in Current RMS? Speed up your warehouse process by barcoding your products and assets. This is optional. Add barcodes to your products and assets to make sure that everything on the opportunity is booked out and ultimately checked back in again. Barcodes can increase the reliability of picking and prepping, as well as speeding up the warehouse process. For serialized products, the barcode is the asset number against the stock level. Each stock level has its own barcode label that you can use to allocate, prep, book out, and check-in that asset. For bulk and non-stock products, you can set a barcode number by editing the product. This number is used to generate a barcode that you can scan to allocate, prep, book out, and check-in any quantity of that product. Already got your own barcode labels? Transitioning from another system or already barcoded your stock? No need to re-label, use your existing barcodes with Current. For serialized stock, enter the barcode number as the asset number of the stock level. For bulk or non-stock, enter the barcode number by editing the product. This also means you can purchase a roll of pre-labelled asset tags and use these with Current RMS. Where do I scan barcodes? 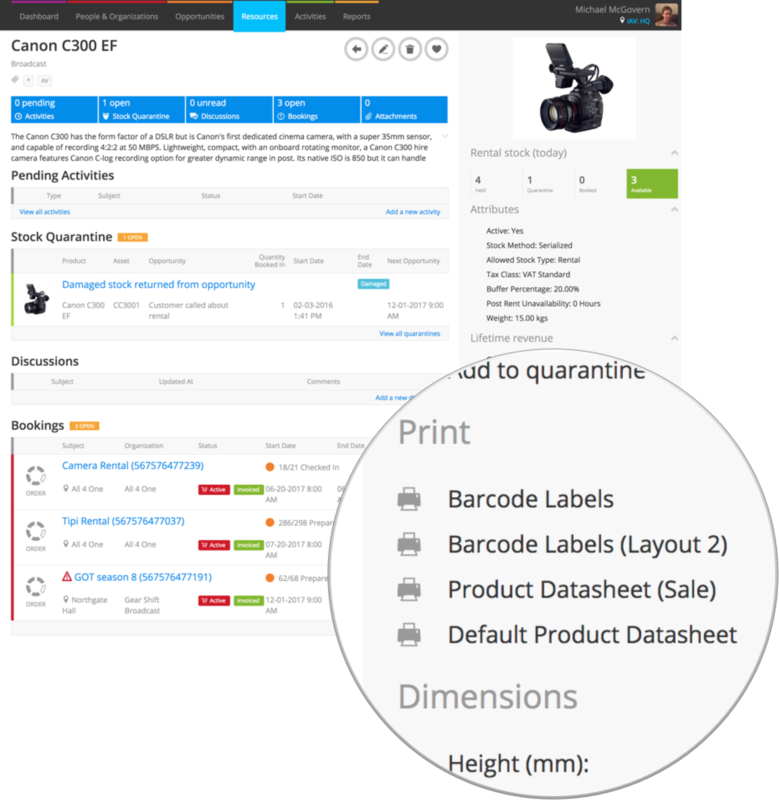 Once you’ve set up your products with barcodes, use them on the opportunity detail view to allocate, prepare, book out, and check-in your products and assets. There’s a guide in our Opportunities section that runs through the warehouse process, check out: What is the detail view? What kind of barcode scanner or printer do I need? As a fully cloud-based solution, Current RMS works across a huge variety of devices: Macs, PCs, Chromebooks, smartphones, tablets, and other devices with internet browsers. Our barcode labels can be downloaded straight to PDF. PDF is an open standard, used to present and exchange documents reliably independent of software or hardware. Provided the barcode printer you purchase works with your device (i.e. with your Mac etc.) and you can print a PDF to it without any special software, it should work with our labels. Nothing fancy or expensive required! Current will work with any USB, WiFi, or Bluetooth barcode scanner that operates as a “keyboard wedge” and is compatible with your device. A keyboard wedge is a widely available type of scanner works by reading the barcode and translating it into key strokes. Make sure the scanner you choose will read your format of barcodes – Current’s default barcode labels use Code 128 – and finish with a carriage return character (i.e. it simulates pressing ↵ enter ). If you’d like to use the QR code, make sure your scanner can read QR codes. Can I scan with my smartphone or tablet's camera? Current RMS is fully browser based, which means that we’re unable to access your device’s camera for use as a barcode scanner right now. Some Bluetooth and WiFi barcode scanners might be compatible with your smartphone, so you can pair these with your device and use them to scan.